Take Control of your Fuel Costs. Fuel is one of the biggest costs in operating a fleet. That’s why the Riggins Fleet Card offers great ways to save, and added benefits for managing your fleet with no hidden fees or extra charge! Fill out the credit application below, or download the pdf and submit by fax or mail. 1. 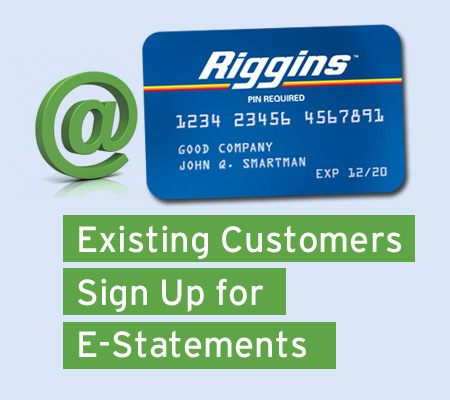 ESTABLISHMENT OF ACCOUNT: If Riggins, Inc. (“Riggins”) approves a credit card account for Customer, Customer acknowledges and agrees that the account will only be used for the purchase of products and services for business purposes and not for personal, family or household purposes. Riggins will issue or cause to be issued accounts or charge cards (a “Card” or “Cards”) under this Agreement. The Riggins proprietary Card is the property of Riggins. It is not transferable, may be revoked at any time, and must be surrendered on demand. Riggins provides odometer readings, miles per gallon and cost per mile data to Customer as a convenience to Customer, but may modify or eliminate such services in its discretion. Riggins relies on the Customer to provide odometer data at the time of sale. Riggins is not responsible if information is omitted or in error on any transaction, nor is this event cause for non-payment. 2. CHARGE CARDS: Customer requests Cards from Riggins for use in accordance with the provisions of this Agreement by individuals, or in connection with vehicles, to be identified to Riggins. Unless earlier revoked or canceled, all Cards shall be valid through their respective expiration dates. Customer may request the issuance of additional Cards, the cancellation of existing Cards, or changes in authorized use thereof. Riggins may issue renewal Cards prior to the expiration date and all such renewal or additional Cards shall be subject to the terms of this Agreement as then in force. Customer agrees that this Agreement controls all purchases made on Customer’s account by Customer or any person who uses a Card or Customer’s account. Customer agrees that use of a Card or the Card number or PIN will constitute authorized use for all purposes. If Customer chooses to leave a Card at a merchant for use by Customer’s drivers, then Customer bear the risk of unauthorized use of said Card and agrees to pay for all charges made thereunder. Subject to any limitations imposed by applicable law, Customer will be liable to us for all unauthorized use of a Card or PIN that occurred prior to Customer’s written notification to Riggins and Customer will not be liable for any unauthorized use that occurred after Riggins receipt of such notification. Customer is required to notify Riggins immediately if the Card is lost or stolen. Customer is responsible for all transactions on the Card, up to the time of notification that the Card was lost or stolen. 3. FLEET INFORMATION AND CHARGE CARDS: The Authorized Customer Representative listed on the Account Application Customer filed with Riggins is authorized to provide Riggins with the information necessary to initially establish Customer’s account records and Cards. The Authorized Customer Representative shall also be the individual authorized to select additional products and/or features that Riggins offers. Riggins is also authorized to send to the Authorized Customer Representative’s attention, or other persons designated by the Authorized Customer Representative, all account summary information and Cards so produced. In addition, the Authorized Customer Representative is the individual designated by Customer to provide all fleet vehicle, driver and other information Riggins may request and receive all Cards and purchase reports and such other information as Riggins may provide from time to time. Unless the Authorized Customer Representative reports to Riggins any errors in the account information or Cards within three (3) business days after receipt thereof, Riggins shall be entitled to rely on such information and Cards for processing Customer’s account. Customer will provide us with reasonable advance written notice of any change in the Authorized Customer Representative. Riggins is also authorized to deal with any contact person with apparent authority to act on behalf of Customer. Customer further agree that additions, updates, and deletions of vehicles, drivers, PINs and Authorized Customer Representatives placed by telephone or electronically, and accepted by Riggins, shall be binding on Customer. 4. CREDIT LINE AND CAPACITY: Customer agrees that Riggins may establish a credit line (limit) for Customer’s convenience, and that Customer’s unpaid credit purchases will not exceed such credit limit. Customer’s account may be suspended if Customer’s unpaid credit purchases exceed Customer’s credit line. Customer will be advised of the credit limit when Customer’s account is approved. Notwithstanding anything to the contrary herein, Customer agrees that Riggins may change Customer’s credit line without notice from time to time based on Riggins’ evaluation of Customer’s creditworthiness and other factors. Customer gives Riggins the right to investigate Customer’s business and/or any Guarantor’s personal credit capacity and credit history. Riggins is authorized to furnish information about Customer and any Guarantor to credit reporting agencies, affiliates, lenders, auditors, entities who finance Riggins’ business and others who may lawfully receive the information. Customer and each Guarantor certifies that the information provided in this application is true, accurate and complete and made for the purpose of persuading Riggins to establish a credit card line of credit for the Customer. The Customer and Guarantor authorize Riggins to obtain any information it considers necessary from any source concerning the statements in this application. 5. SELECTIVE PRODUCT AUTHORIZATION: “Selective product authorization” is provided to Customer as a convenience, but Riggins does not guarantee compliance. Customer is responsible for payment of all product purchases, whether or not Customer’s account has selective product authorization and whether or not such purchases comply. 6. JOINT AND SEVERAL LIABILITY. Customer and each Guarantor are jointly and severally liable to Riggins for full payment and performance of all payment obligations and other terms and conditions hereunder. Customer and Guarantors are sometimes referred to collectively herein as “You.” “We,” “us” or “our” refers to Riggins, Inc. You agree to pay for all purchases or other transactions using Cards in accordance with the terms of this Agreement. Credit will be authorized in our sole discretion and may be canceled at any time without notice. Credit granted by use of a Card may include: (a) a loan by us to you equal to the amount of the Card transaction, and (b) sale of products, goods and other services directly to you by us. You agree to pay us the face amount of all such credit obligations created by use of a Card and all additional charges provided herein. We and you have the right to cancel this Agreement/account as it relates to future purchases. You, of course, remain obligated to pay for all purchases made prior to cancellation. You agree to return all Cards to us upon notice of cancellation. 7. PINs. Use of the Riggins Card shall require the cardholder to be assigned a valid personal identification number (PIN), which shall be entered at the pump to authorize each transaction. PINs shall be established in the manner prescribed by Riggins in its sole discretion. Transaction authorization by PIN shall eliminate the need for a cardholder’s signature in connection with any charges or transactions. Customer is responsible for all PINs once they are approved by Riggins. Customer shall promptly notify Riggins if Customer has lost a PIN or believes that a PIN has become known to a person who is not an authorized party under Customer’s account. Additionally, if Customer wishes to cancel or remove a cardholder from Customer’s account, Customer must notify Riggins in writing to cancel the PIN assigned to such cardholder. Customer, and not Riggins, shall be responsible for all transactions and charges completed with any PIN assigned to Customer’s account. For security purposes, Riggins recommends that Customer take all necessary steps to prevent unauthorized use of a Card and/or PIN, including, without limitation, by: (i) keeping all PINs confidential; (ii) not writing or otherwise recording PINs on any document or in any device that may be accessed by others; and (iii) safeguarding any communications between Riggins and Customer containing PIN assignments. Riggins shall have no obligation to verify the identity of any person utilizing a PIN for charges or otherwise verifying the authenticity of any Card transaction. Riggins shall not be liable for any unauthorized charges and Customer and each Guarantor hereby fully indemnifies and holds Riggins harmless against any claim, charges, damages, actions, suits, proceedings, losses or costs arising out of any unauthorized use of a Card or PIN. 8. BILLING AND PAYMENTS. Purchases are due and payable in full upon billing. Charges must be paid in full notwithstanding request for verification of items. Delinquent accounts will be subject to interest, late fees, suspension, or termination of credit privileges without notice. You agree to abide by the standard rules and regulations of any Automated Clearing House Association processing electronic funds transfer payment transactions under this Agreement. You agree to maintain sufficient funds on deposit in your demand deposit account at your bank to pay in full the total amounts debited to your account pursuant to this Section. You agree to indemnify and hold us harmless from any claim or claims including without limitation any claims based on losses due to (i) labor problems, breakdowns or other non-functioning of any equipment necessary for consummating the transfers contemplated by this Agreement or other causes or circumstances beyond our control, (ii) the acts or omissions of third parties, including without limitation your bank, our bank, the Automated Clearing House Association, the Federal Reserve Bank or any participating bank or courier services; and (iii) noncredit of any deposit. By executing this Application and Agreement, Customer and each Guarantor authorize Riggins to automatically charge any of their respective bank accounts, or any credit card of Customer or any Guarantor, for any outstanding balances that remain unpaid for a period in excess of thirty (30) days. Riggins provides Customer with an executed copy of credit card invoices at the time of sale and a detailed monthly statement. A second copy of invoices will not be provided with the statement. If you request a second copy of invoices from Riggins’ bookkeeping department, your account will be charged 50 cents per copy. 9. INTEREST, FEES, LITIGATION COSTS AND ATTORNEYS’ FEES. If at any time and for any reason You are unable to pay for said purchases when due, You agree to pay interest on any past due amount that is owed to Riggins at the rate of two percent (2%) per month or the maximum legal rate permitted by law, whichever is less. Riggins will calculate the past due amount as the balance of unpaid Customer invoices on the first day of each new statement cycle. In the event that it becomes necessary for Riggins to incur collection costs or to institute a lawsuit to collect any amount due under this agreement, You promise to pay to Riggins an additional administration fee equal to 25 percent of the outstanding balance to cover reasonable attorneys’ fees incurred to collect this debt. In addition You will be responsible for all of Riggins’ attorneys’ fees and costs of litigation incurred in the enforcement of the security interests granted to Riggins hereunder. Payments shall be applied first to unpaid interest and fees and then to the unpaid balance of each product or service purchased in the order of its purchase. 10. REPRESENTATION, WARRANTIES AND ACKOWLEDGMENTS: You represent and warrant to us that this Agreement is valid, binding and enforceable against you in accordance with its terms and, if you are a corporation or other entity, that this Agreement has been duly authorized by all necessary action of your governing body. You agree to provide any evidence of corporate existence and authorization that we may reasonably request. You further certify that the information provided in this application is true and complete and made for the purpose of persuading Riggins to extend credit to Customer for purchases made by Customer. 11. DEFAULT: If You default under this Agreement or any other lending agreement between You and us by not paying any payment when due, exceeding your credit line, or breaching any other term of this Agreement or any other lending agreement between You and us, then we may suspend your account(s), demand immediate payment of the entire unpaid balance and start a lawsuit for collection of the balance and/or enforcement of the security interests granted to Riggins hereunder. All rights and remedies available to Riggins shall be cumulative. 12. WARRANTY DISCLAIMERS AND LIMITATIONS ON DAMAGES: EXCEPT AS OTHERWISE REQUIRED UNDER APPLICABLE LAW, WE MAKE NO WARRANTY WITH RESPECT TO GOODS, PRODUCTS OR SERVICES PURCHASED ON CREDIT THROUGH US. WE FURTHER DISCLAIM ANY AND ALL WARRANTIES WITH RESPECT TO GOODS, PRODUCTS AND SERVICES PURCHASED FROM US, INCLUDING, WITHOUT LIMITATION, THE IMPLIED WARRANTY OF MERCHANTABILITY. YOU ACKOWLEDGE AND AGREE THAT WE WILL NOT BE LIABLE TO YOU FOR ANY LOSS, LIABILITY OR DAMAGES YOU SUFFER WHICH ARISE FROM, ARE RELATED TO, OR IN ANY WAY ARE CONNECTED WITH ANY FRAUD CONTROL OR PURCHASE RESTRICTION MEASURES WE ELECT TO IMPLEMENT FROM TIME TO TIME, UNLESS SUCH LOSS, LIABILITY OR DAMAGES ARE A DIRECT RESULT OF OUR GROSS NEGLIGENCE OR WILLFUL MISCONDUCT. NOTWITHSTANDING ANYTHING TO THE CONTRARY CONTAINED IN THIS AGREEMENT, UNDER NO CIRCUMSTANCES SHALL WE BE LIABLE FOR INCIDENTAL, CONSEQUENTIAL OR SPECIAL DAMAGES ARISING OUT OF ANY TRANSACTION, PRODUCT, GOOD OR SERVICE GOVERNED BY, OR ANY CLAIM RELATING TO, THIS AGREEMENT. THIS LIMITATION OF DAMAGES, INCLUDES, WITHOUT LIMITATION, ANY INCIDENTAL, CONSEQUENTIAL OR SPECIAL DAMAGES ARISING FROM OR RELATED TO THE USE OR MISUSE OF YOUR ACCOUNT. FURTHERMORE, OUR LIABILITY FOR ANY ACTUAL DAMAGES OR AMOUNTS DUE AS A RESULT OF NOT MEETING ANY EXPRESS OR IMPLIED WARRANTIES MADE BY US TO YOU IS LIMITED TO THE ACCOUNT FEES PAID BY YOU DURING THE YEAR PRIOR TO YOUR REQUEST FOR CANCELLATION OR REFUND DUE TO OUR NOT MEETING SUCH GUARANTEES. 13. GOVERNING LAW; VENUE; JURISDICTION: This Application and Agreement shall be governed, construed and interpreted by, through and under the Laws of the State of New Jersey, without regard to conflicts of law principles, and applicable federal laws. Any and all disputes, and any litigation or action arising out of this agreement shall be brought only in the Superior Court of the State of New Jersey, Cumberland County, or the United States District Court, Camden, New Jersey. The parties accept the exclusive jurisdiction and venue of such courts and the application of such laws. The parties irrevocably waive any objection in connection with any such action or proceeding, including without limitation any objection to the laying of venue based on the grounds of forum non conveniens. 14. MISCELLANEOUS: The forbearance, failure, or delay of Riggins in exercising any rights, powers, or remedies available to it hereunder or under applicable law shall not be a waiver of such right, power, or remedy, nor shall the exercise of such right, power, or remedy preclude its further exercise. 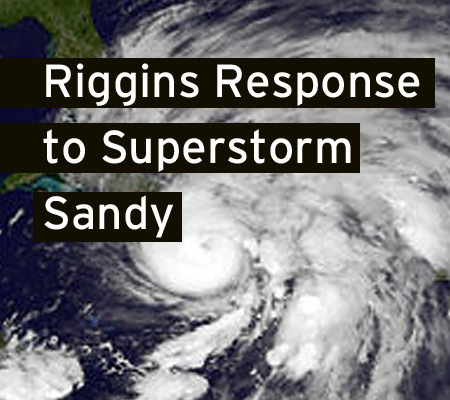 Every right, power, and remedy available to Riggins shall continue in full force and effect until expressly waived by a written instrument executed by an authorized representative of Riggins. In the event any provision of this Agreement is held to be invalid or unenforceable under any law, rule or regulation of any governmental agency, (federal, state or local), that fact will not affect the validity or enforceability of any other provision of this Agreement. This Agreement, individual transactions hereunder, Your account and any and all of Your obligations hereunder may be assigned by us without further notice to You. All of our rights under this Agreement shall also apply to any assignee of this Agreement, individual transactions hereunder or your account. However, You may not assign this Agreement or Your obligations hereunder, without the prior written consent of Riggins. This is an agreement between you and us and no other entity shall be deemed a party to this Agreement or third-party beneficiary hereof. 15. ENTIRE AGREEMENT: This Agreement and Account Application, any other written agreements that secure or guaranty your obligations under this Agreement, any electronic payment agreement, enrollment forms and any written amendments, modifications (including modifications made by Riggins upon written notice to you as permitted in this agreement), substitutions, or replacements thereof or thereto, is a final expression of the credit agreement between us and you and may not be contradicted by evidence of any alleged oral agreement or amendment. Any terms different from this Agreement or contradictory to this Agreement that are set forth in a Purchase Order or other communication are expressly rejected and shall under no circumstances modify the terms of this Agreement. Photocopies, electronic copies and facsimile copies of signed originals shall be binding as originals. Download General Terms and Conditions PDF for a printable version of the General Terms and Conditions.